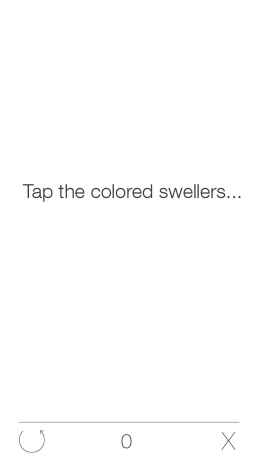 Sweller is a mobile game built for iPhones. The main goal of the project was to find a way to engage users quickly in an intuitive and rewarding playground. 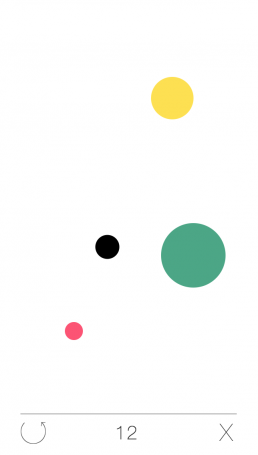 The idea behind the game was simple - have users tap rapidly growing circles that appear at random before they shrink and disappear. 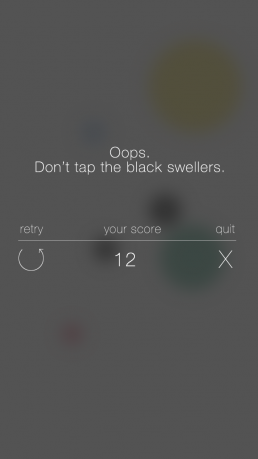 You miss three circles, or tap a black circle, and it’s game over. Honest game development means creating a game that is genuinely fun to play. With a concept so simple at heart, the key was to rapidly convey information about the swellers without interrupting game play. We quickly realized that the lifespan of a sweller should be illustrated using both size and color. To make the color scheme intuitive we settled on a toned down green, yellow and red lifecycle for the swellers. Our goal was to get people excited enough about the game to play for at least three minutes. A key part of this was keeping the time spent from clicking the iPhone app to actually playing at a minimum. Additionally, an easily accessible “play again” button that let’s you start over as soon as the game ends was important. We spent over 80 hours conceptualizing game ideas that would make Sweller fun to play. Then we spent another 80 hours designing an interface that was simple, yet intuitive. Respecting privacy, we didn’t ask for the users to let us listen through their mic. So we can’t say if they actually said the game was fun but if engagement times speak louder than words – they more than loved the game. Average engagement time was 7-10 minutes per user. Yup. We went well over 100% of our required game play time. And that is how we do things.